Never put it past Christy Clark to drop the ball. Starting January 16, 2017 she’ll start handing out 37,500 dollar freebies to over leveraged and desperate first time buyers. Essentially adding on a second mortgage to over extended first timers 5 years down the road. Of course this comes on the same day the Bank of Canada warned about excessive household debt levels and a stronger possibility of a housing crash. As per the Bank of Canada Nearly a third of recent Canadian homebuyers with so-called high-ratio mortgages wouldn’t qualify for their loans under new rules recently implemented by the federal government. 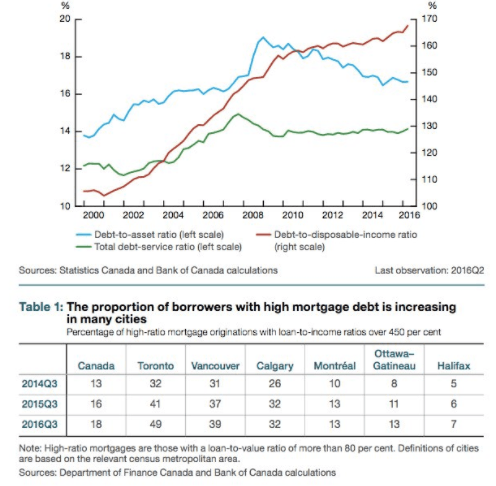 The number of high ratio mortgages in Vancouver above 450% loan to income has soared to 39% in recent years. Like an epidemic, high ratio mortgages have exploded across Vancouver over the past 2 years. So while, the Bank of Canada and CMHC continue to warn of excessive debt levels and overvalued real estate, Christy Clark is encouraging first time buyers to jump into the market. The same buyers the Bank of Canada is trying to get out of the market. Christy Clark, who just a few months ago called Vancouver a housing bubble, has just added more fuel to the fire. Stirring up more demand at the entry level market that was in the process of correcting. (Condo sales down 22%, townhouse sales down 40%). Apparently UBC Economist Tom Davidoff agrees. Davidoff said it will drive up prices by giving buyers more money to bid on properties, and any benefit will be eaten up by developers and realtors. While i’m skeptical it will drive up prices it is certainly a possibility. “The fact is it does help first time home buyers and relieves the pressure on the bank of mom and dad,” said Neil Moody, CEO of the Canadian Home Builders Association of BC. But is this initiative really aimed at helping first time buyers? Or is it aimed at pleasing the development industry which Christy Clark enraged with her 15% foreign buyers tax. I work with a lot of first time buyers being a younger guy myself. Of course everyone would love to own a home. But the reality is many shouldn’t or are not in a position where they should be entering the market. So although this initiative might appear as “helpful”, it’s really not. It has the Potential to re-ignite a correcting market. Giving away cheap and easy money never ends well. Just see the US housing Crisis or our current record high household debt levels. Most won’t be prepared to take on Christy Clarks second mortgage in 5 years when it comes time to pay up. It won’t look so good in 5 years, and the taxpayer will be on the hook.